Brown-Van Hemert Funeral Homes has been serving Hudson, Addison & Onsted area families for years. We are honored to be a part of the rich history of this community and plan to be a part of it for many years to come. Brown-Van Hemert Funeral Homes Hudson, Inc. It all began when Charles E. and Maude Brown lost their funeral home in Ypsilanti, after a tornado swept through that city. They came to Hudson, and on February 9, 1893 established the Brown Funeral Home. At that time the business was not separate, but usually combined with another business. Theirs happened to be a furniture store, with both businesses being in the old Stucky building. Charles' and Maude's son, Clarence, received his diploma in Mortuary Science in 1919. His wife Eloise related some of these interesting facts in past historical documents. In those days, funerals were usually held in the family home. The funeral director would place a symbol on the front entrance of the home, designating that someone had passed away and the family was in mourning. This symbol was known to some as the door-crepe or door-badge. The color denoted whether it was a child (white) or an adult (purple and black). These colors also were displayed on the side of the horse drawn hearse. They had two carriages for hearses, white for children and black for adults. Two hundred dollars provided a respectable funeral. Along with this price the director would provide chairs for the service and a horse drawn carriage for the family. There was always a soloist for each funeral, and Eloise noted she had sung for many funerals. In those days, funeral homes were also acting as an ambulance service, with some even taking calls for the local fire department. This was the case for the Brown's. Their first ambulance was a big seven passenger Pontiac car purchased from Bill Thompson. Eloise remembered the first ambulance patient taken to Toledo Hospital, joined in partnership as Lowe and Brown Funeral Service. A little later Clarence Bray, who was working with the Browns became a partner. The name was changed to Bray and Brown. 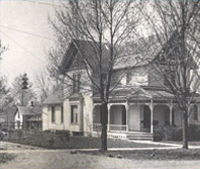 In 1914, Clarence and Eloise Brown moved into the old Orrin Pierce home on West Main Street. He joined his father in business and it became Charles E. Brown and Son Funeral Service. In 1929 the business was moved to the old Pierce home, which separated the funeral home from the furniture business. Mrs. Charles Brown died in 1934, and in October of that year the father and son established a funeral home in Addison. Charles Brown passed away in 1952. Clarence Brown continued as Brown Funeral Home and David Van Hemert joined him in 1954. The Van Hemert's purchased the business when Clarence became sick and signed the ownership papers over on September 12, 1966. The business then became Brown- Van Hemert Funeral Home, as it stands to this day. On February 23, 1971 the funeral home had a major fire, which started in the garage. It was discovered by 13 year old Robert. He had just come downstairs to the kitchen when he smelled smoke, opened the door to the garage and was met with a wall of flame and smoke. The home received extensive fire, smoke and water damage. Hudson Fire Department summoned assistance from Clayton, Addison and Pittsford departments. The funeral home was operated from 500 West Main Street while the new facility was being built. Dedication of the new facility was held on Sunday, June 18, 1972. The modern establishment more than adequately meets the needs of the Hudson and surrounding areas. The interior decor offers a cozy, home-like atmosphere complete with fireplace. Brown-Van Hemert Funeral Homes Addison, Inc.
Charles E. Brown and son, Clarence, of Hudson, purchased the former W.A. Satterlee Funeral Home of Addison, Michigan in October 1934. The W.A. Satterlee Funeral Home had been in business twenty-three years prior to the Brown's purchasing the facility. Charles E. Brown had conducted business in Hudson for forty years and his son had been associated with him for twenty years prior to the Addison facility purchase. David L. Van Hemert started working for Clarence E. Brown and Son Funeral Home in 1954, upon his graduation from Wayne State University School of Mortuary Science. He moved to Addison from Muskegon, along with his wife and young daughter Brenda. Their son Robert was born in 1957 at Addison Hospital. David purchased the Addison and Hudson businesses on September 12, 1966. In 1967, David and his family moved to the Hudson location. Robert and wife Sheila moved into the Addison facility November of 1980 upon Robert's graduation from Wayne State University School of Mortuary Science. Robert manages the Addison facility. This establishment was operated as a business and home as their family began to grow. In July 1994 construction began on the current facility, which is located on U.S. 127, known as Steer Street in the village. The official opening was held on October 8, 1995. Robert and his family currently live in the old establishment, which is located directly behind the current facility. We wanted our new facility to feel warm and friendly, and that certainly has been achieved. The interior throughout the building consists of warm, home-like colors complete with a fireplace, as opposed to the dark and cold decor found in many funeral homes. This 5300 square foot building can comfortably accommodate the needs of Addison and its surrounding areas. We have been honored with countless compliments by our visitors regarding how home-like and comfortable our facility is. If you haven't had the opportunity to visit our Addison establishment, give us a call and we'd be happy to provide a tour. 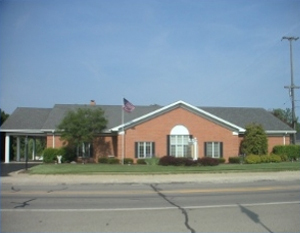 Brown-Van Hemert Funeral Homes Onsted, Inc.
G. Owen Dunn previously owned the Onsted Location. The Dunn Funeral Home was located directly across the street from the current location, established in 1938. Several years later, upon the death of Dr. Stafford's mother, Owen Dunn purchased the Stafford home and converted it into a funeral home, which included living quarters. A major part of this conversion included an addition on the North side of the home, which was completed prior to the Dunn family moving and resuming business at the new location. Mr. and Mrs. Dunn have two children, Sally and Doug. Mr. Dunn passed away February 25, 2008. Owen's wife, Alza, passed away October 25, 1989. Upon speaking with Mr. Dunn, obtaining this history information, he indicated he had previously worked for Ritter Funeral Home, which was located on the South end of Onsted. Owen had graduated from the Cincinnati School of Mortuary Science and had taken employment at Ritter Funeral Home upon the death of Mr. Ritter. He worked for this establishment approximately 10 years prior to establishing his own business in Onsted. After leaving Ritter Funeral Home, Owen had no idea where his path would lead. Mr. Dunn received calls, during this time, requesting his services. Being he had no established business at the time, he utilized Arnold Lane Funeral Home in Parma for this purpose. Owen and Mr. Lane were good friends. This assisted him in making a decision to establish his own funeral home in Onsted. 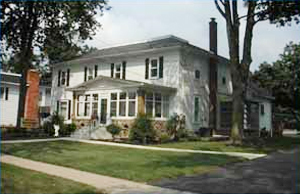 Several years later, Dunn Funeral Home became the only funeral home in Onsted. On Dec. 31, 1973, David L. Van Hemert purchased the funeral home from Mr. Dunn. Interior work was completed on the establishment and in the Spring of 1974 Dave's daughter, Brenda LaFollette, took residence along with her husband Jack and infant son Troy. Mr. Dunn still acted as Manager of the establishment during that time, for a number of years until his retirement. Brenda currently resides at the Onsted facility. Her husband, Jack, passed away in May of 2017 after a twelve year battle with cancer. Their son Troy and wife Jody reside in Dexter, Michigan.